A year ago, the Padres brought back Tyson Ross on an incentive-laden, one-year contract. He had had his best years in San Diego earlier this decade, but underwent Thoracic Outlet Syndrome in 2016; the track record of recovery following that surgery has been spotty at best. Ross made 10 ugly starts for the Rangers in 2017 before the Padres guaranteed him $1.75 million last season. Early in the year, Ross looked like a promising trade chip for a rebuilding San Diego team, using his slider often to get outs. But that wasn’t the way the season ended for the right hander, who was claimed off waivers by the Cardinals. Now, the Tigers are going to try the same gambit as they rebuild. According to Ken Rosenthal, Detroit has agreed to a deal with Ross for one year and $5.75 million. While the Padres were likely hopeful in May that they would receive a decent prospect for Ross, he ended up netting them nothing. As the year wore on, his arm wore down. In June and July, he made 10 starts, striking out just 16% of batters and walking 11%, and gave up 10 homers on the way to a 5.93 FIP and 5.81 ERA. That incentive-laden contract turned out to be a burden for the Padres, who had to pay Ross $200,000 for each of his starts from number 20 through start 29. St. Louis used Ross mostly in relief, and while his strikeout and walk numbers weren’t any better, he gave up just one homer in 26.1 innings. This is what Ross’ fastball velocity looked like during the year. His velocity dipped after a strong start, and was inconsistent the rest of the way, though it ticked back up at the very end of the season. Ross used a cutter more often with the Cardinals and that might have helped increase his ground ball rate and help him last as a starter. Perhaps more experimenting with his good slider could help keep batters off balance. It’s possible Ross simply can’t withstand starting for a full season given his injury history. Maybe with a year under his belt post-surgery, he’ll have more strength built up to make it through a full year. 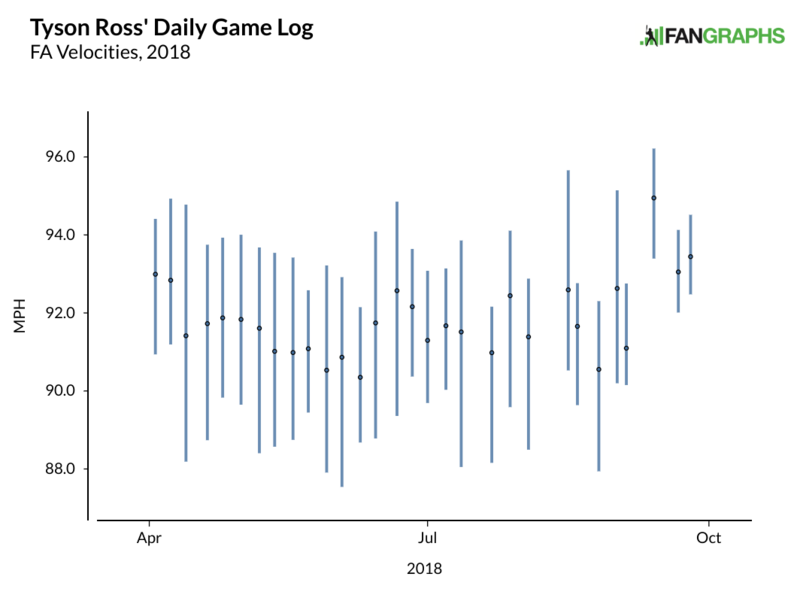 Ross is pretty far removed from his good seasons, but he’s less than a year removed from being an effective starter, at least for a stretch. The Tigers have made a minimal commitment with low expectations, and can afford to see what the 31-year-old has to offer. If Ross can put it back together again, and if he does, they might be rewarded at the trade deadline. We hoped you liked reading Tyson Ross to Be Trade Chip, Again, Maybe by Craig Edwards! 5.7 million for Ross really seems like an overpay to me. My guess is that in order to settle for one year coming off an okay season (1.29 WHIP) , he wanted a slightly higher pay. $5.7M isn’t that much. Its a cheap price with the upside to flip him.